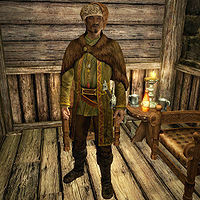 Hemming Black-Briar, a Nord warrior, is the son of Maven Black-Briar and father to Ingun and Sibbi. Mjoll the Lioness, Riften's self-appointed protector, describes Hemming as a "spoiled brat" who follows his mother's word "like a loyal dog follows its master". Maul, Maven's bodyguard, also describes Hemming as stubborn, "like his mother; he sees what he wants and he won't quit until he has it." Should Maven become Jarl after the Imperials claim the Rift, Hemming will be appointed as her steward, and relocate to Mistveil Keep. Hemming spends the majority of his time inside Black-Briar Manor, and only ventures outside to meet his mother for drinks at the Bee and Barb in the evenings, between 8pm and his bedtime at midnight. After waking up at 8am he enjoys a two-hour breakfast then wanders around the house until 6pm when he sits down for a two-hour dinner. If Maven is appointed Jarl, Hemming will move into Mistveil Keep as her personal steward. He will move into his predecessor’s old quarters and sleep there every night between midnight and 8am. He then spends the entire day at Maven’s side, pausing only to sit down for meals at 8am, 1pm, and 7pm. If Riften is controlled by the Stormcloaks, upon first meeting him, he will comment, "Fancy yourself the adventuring type, eh? It's just as well, I doubt your combat prowess would prove valuable in a real battle anyway." He will then explain himself, "I was trained by some of the finest warriors in all Skyrim to wield a blade as if it was an extension of my own arm. My mother spares no expense where I'm concerned. I'm heir to the family fortune after all." He will reveal his ambitions for his family's meadery, "Once I'm in charge I have bigger aspirations than just Skyrim. I plan to bring Black-Briar Mead to all of Tamriel." and talk about his children, "My children, Sibbi and Ingun, are being groomed to run the family business one day as well. Sibbi will prove to be a fine leader one day, but Ingun... that girl has her mind somewhere other than business. Maven's disappointed that Ingun's heart isn't in the family business, but she says 'Ingun still has her uses.' Not sure what that means." Some dialogue incorrectly identifies Maven as the mother of Ingun and Sibbi instead of their grandmother. Esta página foi modificada pela última vez à(s) 10h16min de 8 de março de 2016.